Ancient City of Sigiriya is the most visited historic site in Sri Lanka. The ruins lie on the steep slopes and at the summit of a granite peak standing some 180m high, the ‘Lion’s Rock‘, which dominates the jungle from all sides. Sigiriya is an ancient palace located in the central Matale District near the town of Dambulla in the Central Province, located 100 miles northeast of Colombo, is a very important Buddhist site in Sri Lanka. Famous for its palace ruins on top of a massive 200 meter high rock surrounded by the remains of an extensive network of gardens, reservoirs and other structures. There are about 1200 steps or 200m up to the summit of the UNESCO listed World Heritage Site, a walk up to the top and down again in about 1.5-2 hours. 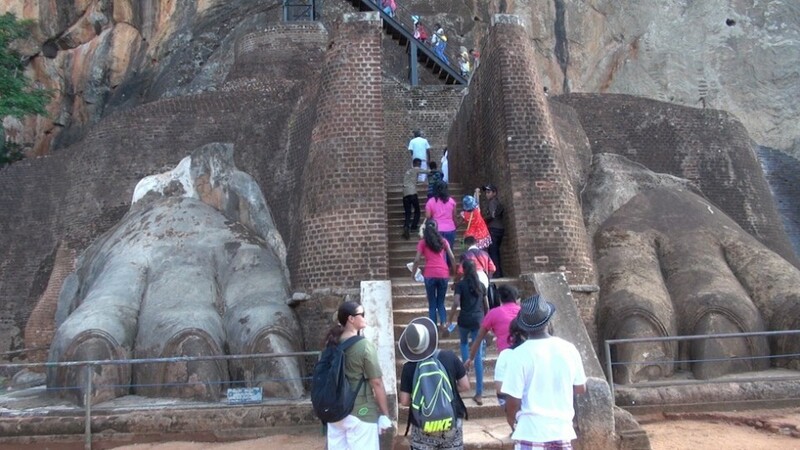 The Government of Sri Lanka focused its attention on Sigiriya in 1982, and archaeological work began on the entire city for the first time under The Cultural Triangle Project. The Sigiriya site contains the ruins of an upper palace located on the flat top of the rock, a mid-level terrace that includes the Lion Gate and the mirror wall with its frescoes, and the lower palaces located behind the lavish lower gardens, and moats and ramparts which protected the citadel. 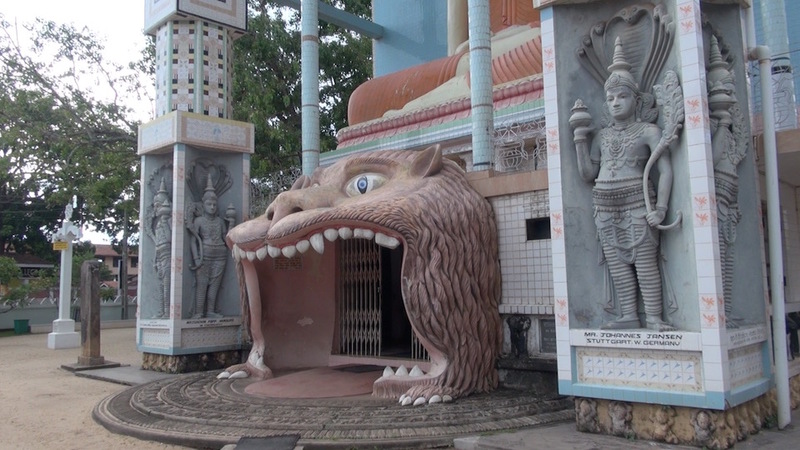 According to the ancient Sri Lankan chronicle this site was selected by King Kasyapa (477 – 495 CE) for his new capital. 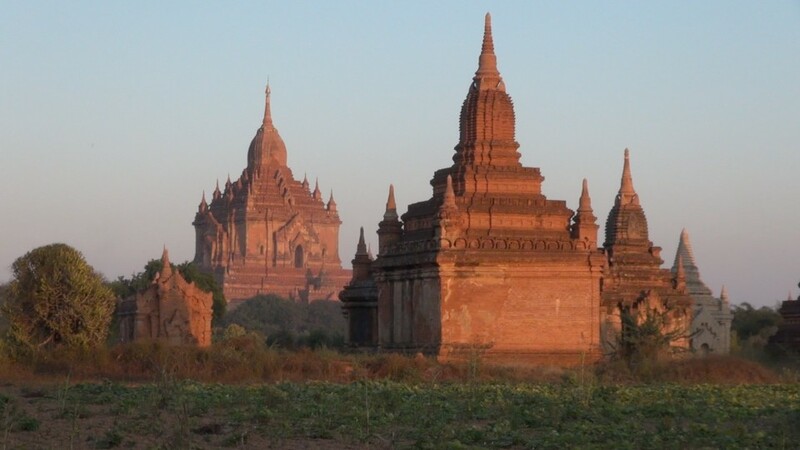 Legend has it, King Kasyapa built it in order to protect against attacks from his brother, whom he had stolen the throne from. He built his palace on the top of this rock and decorated its sides with colourful frescoes. On a small plateau about halfway up the side of this rock he built a gateway in the form of an enormous lion.The only way into the city is through the giant lion’s jaws. There was a sculpted lion’s head above the legs and paws flanking the entrance, but the head collapsed years ago. 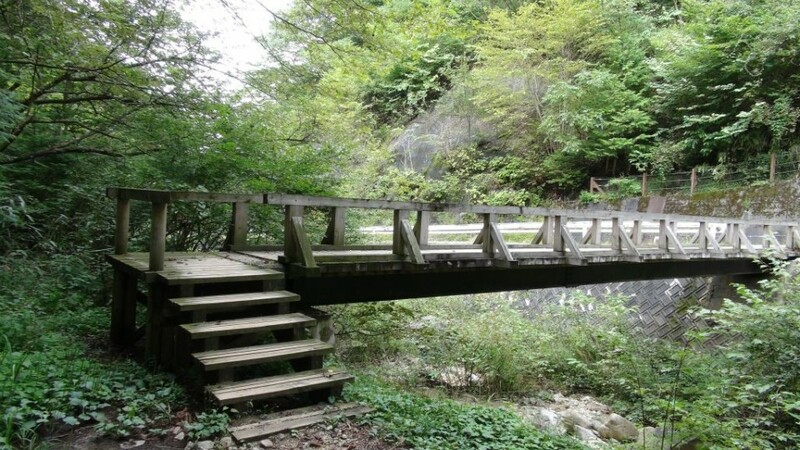 The name of this place is derived from this structure —Sīhāgiri, the Lion Rock. The capital and the royal palace was abandoned after the king’s death. 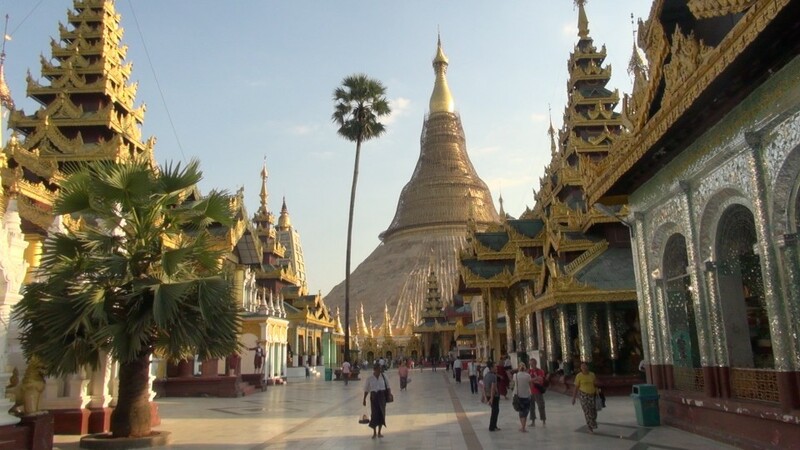 It was used as a Buddhist monastery until the 14th century. The paintings would have covered most of the western face of the rock, an area 140 metres long and 40 metres high. There are references in the graffiti to 500 ladies in these paintings. However, most have been lost forever. More frescoes, different from those on the rock face, can be seen elsewhere, for example on the ceiling of the location called the “Cobra Hood Cave”. 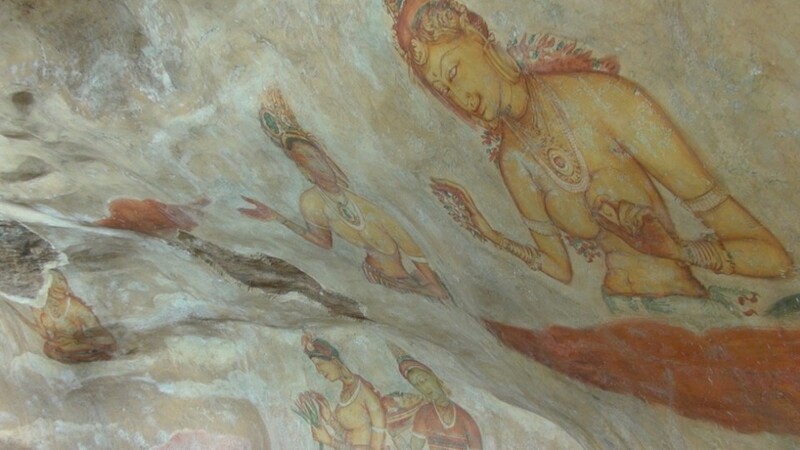 Although the frescoes are classified as in the Anuradhapura period, the painting style is considered unique; the line and style of application of the paintings differing from Anuradhapura paintings. The true identity of the ladies in these paintings still have not been confirmed. There are various ideas about their identity. Some believe that they are the ladies of the king’s while others think that they are women taking part in religious observances. The Mirror Wall and spiral stairs leading to the frescoes. Originally this wall was so highly polished that the king could see himself whilst he walked alongside it. Made of brick masonry wall and covered in highly polished white plaster, the wall is now partially covered with verses scribbled by visitors to the rock. The mirror wall has verses dating from as early as the 8th century. People of all types wrote on the wall, on varying subjects such as love, irony, and experiences of all sorts. Further writing on the mirror wall now has been banned. The Gardens of the Sigiriya city are one of the most important aspects of the site, as it is among the oldest landscaped gardens in the world. The gardens are divided into three distinct but linked forms: water gardens, cave and boulder gardens, and terraced gardens.